New York saxophonist Laura Dreyer comes to Baltimore for the first time, leading a top-flight quartet of world wise recording and performing artists. Their program demonstrates the special sound that Brazilian jazz has developed in the New York jazz scene. Dreyer was born and raised in the U.S. on the West Coast. Known widely as a saxophonist, flutist and composer, she has pursued her passion for Brazilian music for over 20 years while also cutting a strong career path in American jazz. Today she combines her vast experience as a jazz musician with her passion for Brazilian musical styles, performing in the U.S. and Brazil. Appearing with her are renowned German pianist, composer and arranger Klaus Mueller, now based in New York City with virtuoso seven-string bassist Leonardo Lucini and his brother, drummer Alejandro Lucini, from Rio de Janeiro. 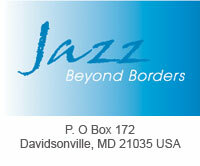 The program features original contemporary Brazilian jazz, as well as arrangements of Brazilian jazz classics. Dreyer’s compositions combine catchy, lyrical melodies in a variety of Brazilian styles such as samba, bossa nova, baião, ijexá, maracatu, partido alto, and more. Music lovers will hear Dreyer’s “Caminhos Novos,” which means “New Paths” in English. The composition is inspired by the “Pagode” samba style, and captures the enthusiasm and positivity characteristic of this style of samba. Listeners may recognize the funky samba “Bronx,” composed by popular Brazilian composer and pianist Tania Maria in the 1980s when she lived in New York. Equally engaging is the Dreyer original “O Macaco Azul,” or “The Blue Monkey.” The tune is a “Baião,” a rhythm from the Northeast of Brazil. Hear another popular piece in the same style. “Ponteio,” by Brazilian songwriter Edu Lobo won Best Song at the third Festival de Música Popular Brasileira. Laura Dreyer has headlined the Mary Lou Williams Women in Jazz Festival in Washington, D.C. and the Syracuse Jazz Festival She has played with jazz greats such as Walter Bishop Jr., Mel Lewis, Dr. Billy Taylor and Nnenna Freelon, and many more touring with the legendary Diva Jazz Orchestra earlier in her career. Currently a member of Brazilian pianist Dom Salvador’s sextet, Dreyer is featured on The Art of Samba Jazz. The album received a Premio da Musica Brasileira award for Best Instrumental CD. She has performed with other Brazilian jazz greats such as Antonio Adolfo, Marcos Silva, Portinho, Leny Andrade, Helcio Milito and Cidinho Texiera. She has recorded many albums as a leader, most recently Vida Arte Armor on Mayimba Jazz in 2014, and many others as a side-person. In Brazil Dreyer has appeared at the Copacabana Palace, Triboz and Santo Scenarium in Rio. She performs regularly at NYC clubs such as Cornelia Street Café, Zinc Bar, and Fat Cat. On the West Coast she has appeared at Yoshi’s in San Francisco, Birdland Jazzista Social Club and The Sound Room in Oakland and Tula’s in Seattle. Pianist Klaus Mueller was raised in Japan, Chile and Brazil. Classically trained, his multicultural upbringing led him to many musical languages, and he added jazz, pop and world music to his classical repertoire. Mueller studied piano at the prestigious State University of Music and Performing Arts in Stuttgart, Germany. Visiting his parents in Rio de Janeiro, he was strongly influenced by samba and bossa nova and soon shared the stage with the likes of Tania Maria and Edmundo Carneiro. The favorable release of his debut CD in 1997 on JazzHaus Musik made him an in-demand performer on the European circuit. A year later he was immersed in Manhattan’s music scene, playing the Blue Note, Birdland and Zinc Bar. He won a scholarship to The New School, graduating in 2000. In 2003, he collaborated with Robert Sadin to produce orchestral arrangements for Herbie Hancock’s “Gershwin’s World” tour. Mueller plays often with world beat band Portinho Trio, led by the Brazilian master drummer of the same name. He co-arranged music on the band’s CD, Vinho do Porto on Pittsburgh label Manchester Craftsmen’s Guild. He also collaborates with the Nilson Matta Brazilian Voyage Trio. Brazilian bassist Leonardo Lucini and Alejandro Lucini on drums and percussion are prominent artist/educators in the Baltimore/Washington/Annapolis triangle. With their band Origem they have greatly increased the interest and appreciation of Brazilian culture in the region. Combining their deep knowledge of Western classical, jazz and Brazilian music, they perform widely and appear on numerous recordings. Many acclaimed international musicians have performed with them: pianists Alex Brown, Benito Gonzalez, Arturo O’Farrill and Federico Peña; saxophonists Alex Han, Leo Gandelman, Raul Mascarenhas and Paulo Moura, and guitarist Rogerio Souza. In Brazil, Leonardo Lucini performed with well-known groups and artists such as Nó Em Pingo D'Agua and the Orquestra de Música Brasileira. In the States, the brothers enliven major music festivals and bring their intriguing music to universities, museums and jazz clubs, appearing frequently at The Kennedy Center, Smithsonian and other prominent venues. Twins Jazz will present “Laura Drey: Manhattan-Rio Connection” on May 6 and 7, with shows at 9:00 p.m. and 11:00 p.m. The venue is located in at 1344 U St NW, Washington, DC 20009. Tickets $15. The show is likely to sellout, so advance reservations are strongly advised. Purchase in advance from http://www.twinsjazz.com.